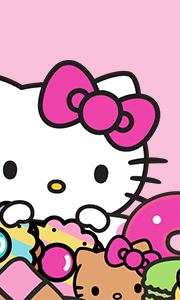 Hello Kitty Goes to the Movies: Hello Kitty goes out of this world to save "K.T. - The Kitty Terrestrial". Then, Kitty learns that there's no place like home, furry home in "The Wizard of Paws". And everybody loves Hello Kitty, even monsters! It's furry -tale fun with "Kitty and the Kong". Then, in "Cat Wars", Princess Kitty must save planet Caturn from the clawed clutches of Darth Catnip! Finally, Kitty's off to Catalina Island to save..
Own Growing Up With Hello Kitty DVD from Deff, DVD, Blu-Ray & 4K Video Specialists - Free UK Delivery..
Own Hello Kitty - A Birthday Partyand Four Other Episodes DVD from Deff, DVD, Blu-Ray & 4K Video Specialists - Free UK Delivery..
Own Hello Kitty - A School Dayand Four Other Episodes DVD from Deff, DVD, Blu-Ray & 4K Video Specialists - Free UK Delivery.. Growing Up With Hello Kittyi Can Share With Friends And 5 Other StoriesGrowing Up With Hello Kittyi Can Share With Friends And 5 Other StoriesGrowing Up With Hello Kittyi Can Share With Friends And 5 Other Stories..
Own Hello Kitty And Friends - Alice In Wonderland And Four Other Stories DVD from Deff, DVD, Blu-Ray & 4K Video Specialists - Free UK Delivery..
Own Hello Kitty And Friends - Heidi And Two Other Stories DVD from Deff, DVD, Blu-Ray & 4K Video Specialists - Free UK Delivery..
Own Hello Kitty And Friends - Heidi DVD from Deff, DVD, Blu-Ray & 4K Video Specialists - Free UK Delivery..
Own Hello Kitty And Friends - Mum Loves Me After All DVD from Deff, DVD, Blu-Ray & 4K Video Specialists - Free UK Delivery..
Own Hello Kitty And Friends - Snow White DVD from Deff, DVD, Blu-Ray & 4K Video Specialists - Free UK Delivery..
Own Hello Kitty And Friends - The Magic Apple And Three Other Stories DVD from Deff, DVD, Blu-Ray & 4K Video Specialists - Free UK Delivery..
Own Hello Kitty And Friends - The Magic Apple DVD from Deff, DVD, Blu-Ray & 4K Video Specialists - Free UK Delivery..
Own Hello Kitty And Friends - The Sleeping Princess DVD from Deff, DVD, Blu-Ray & 4K Video Specialists - Free UK Delivery..
Own Hello Kitty And Friends - The Wonderful Sisters DVD from Deff, DVD, Blu-Ray & 4K Video Specialists - Free UK Delivery..
Own Hello Kitty Stump Village - A Strange Penguin DVD from Deff, DVD, Blu-Ray & 4K Video Specialists - Free UK Delivery..
Own Hello Kitty Stump Village - Happy Halloween DVD from Deff, DVD, Blu-Ray & 4K Video Specialists - Free UK Delivery..
Own Hello Kitty Stump Village - Little Twin Stars And Three Other Stories DVD from Deff, DVD, Blu-Ray & 4K Video Specialists - Free UK Delivery..
Own Hello Kitty Stump Village - The Circus And Three Other Stories DVD from Deff, DVD, Blu-Ray & 4K Video Specialists - Free UK Delivery..
Own Hello Kitty Stump Village - The Mask Party DVD from Deff, DVD, Blu-Ray & 4K Video Specialists - Free UK Delivery..
Own Hello Kittys Fun Times With Friends & Other Stories DVD from Deff, DVD, Blu-Ray & 4K Video Specialists - Free UK Delivery..
Own Hello Kittys Fun Times With Friends Cinderella Plus 5 Other Stories DVD from Deff, DVD, Blu-Ray & 4K Video Specialists - Free UK Delivery..
Own Hello Kittys Fun Times With Friends Sleeping Beautyplus 5 Other Stories DVD from Deff, DVD, Blu-Ray & 4K Video Specialists - Free UK Delivery..
Own Hello Kittys Fun Times With Friends thumbelina Plus 5 Other Stories DVD from Deff, DVD, Blu-Ray & 4K Video Specialists - Free UK Delivery..
Own Hello Kittys Paradise - A Blooming Good Morning And 5 Other DVD from Deff, DVD, Blu-Ray & 4K Video Specialists - Free UK Delivery..
Own Hello Kittys Paradise - Happy Birthday Papa And 4 Other Storie DVD from Deff, DVD, Blu-Ray & 4K Video Specialists - Free UK Delivery..
Own Hello Kittys Paradise - Paper Play And 4 Other Stories DVD from Deff, DVD, Blu-Ray & 4K Video Specialists - Free UK Delivery..
Own Hello Kittys Paradise A Fair Share And 4 Other Stories DVD from Deff, DVD, Blu-Ray & 4K Video Specialists - Free UK Delivery..
Own Hello Kittys Paradise DVD from Deff, DVD, Blu-Ray & 4K Video Specialists - Free UK Delivery..
Own Hello Kittys Paradise Underground Kitty - The Complete Series DVD from Deff, DVD, Blu-Ray & 4K Video Specialists - Free UK Delivery..
Own Hello Kittys Paradise: Making Cookies And 4 Other Stories DVD from Deff, DVD, Blu-Ray & 4K Video Specialists - Free UK Delivery..
Own Hello Kittys Paradise: Minding Manners And 5 Other Stories DVD from Deff, DVD, Blu-Ray & 4K Video Specialists - Free UK Delivery..
Own The Adventures Of Hello Kitty & Friends - Lost And Hound And Four Other Episodes DVD from Deff, DVD, Blu-Ray & 4K Video Specialists - Free UK Delivery..
Own The Adventures Of Hello Kitty - Happy Halloween Everybody And 4 Other Episodes DVD from Deff, DVD, Blu-Ray & 4K Video Specialists - Free UK Delivery..
Own The Adventures Of Hello Kitty - Wheres Santa And Four Other Episodes DVD from Deff, DVD, Blu-Ray & 4K Video Specialists - Free UK Delivery..
Own The Adventures Of Hello Kitty - Wheres Santa Plus DVD from Deff, DVD, Blu-Ray & 4K Video Specialists - Free UK Delivery..
Own The Adventures Of Hello Kitty And Friends DVD from Deff, DVD, Blu-Ray & 4K Video Specialists - Free UK Delivery..